A new study shows that the use of social media is particularly prevalent among Inc. 500 companies and provides new insight on the role social media plays in running a business. For the third consecutive year, the Center for Marketing Research at the University of Massachusetts Dartmouth, has conducted a study on social media usage among Inc. 500 companies. The 2009 results confirm the upward trend of social media adoption rates among some of the fastest growing private companies, and provide a useful comparison of social media trends from 2007 on. There is confusion between traditional advertising agency and PR models as to who should handle social media (the new medias). They both bring different skill sets to the table. This should not deter clients or agencies from the bigger picture: social media can compliment your existing ad campaign. The problem is that we are allowing all this new technology to complicate matters even when it is really quite simple in my opinion. Branding and advertising will always be necessary whether you use either a Facebook fan page, a blog or simply rely on traditional medias to enhance your brand. An advertising agency should have no problem embracing new medias as another tool or an enhancement to what is already in existence. Who’s in Charge of Social Media? That’s led some agencies to reorient the type of accounts they pursue. Deep Focus, a digital shop, was primarily an online promotions agency that worked heavily in the entertainment industry. Its social media chops is leading it in a different direction, according to Schafer, as about eight clients are using it as an “engagement agency.” It recently was put on Microsoft’s roster, for instance, to serve as social media agency for Bing. That’s led Deep Focus into competition with upstart social media consulting firms. “There’s a hodgepodge of firms who can deliver elements, but … most are really new, young and underdeveloped,” he said. Facebook or Just Face-Look? Are People 55 And Older Really Using Social Networking Websites? 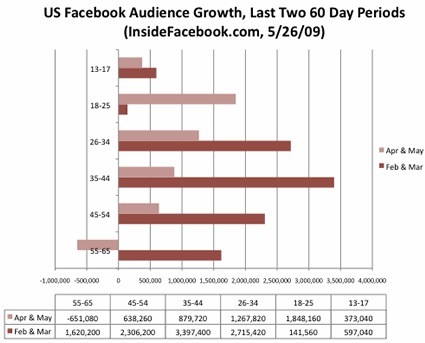 Facebook is estimated to have 70.2 million unique visitors per month in the United States according to comScore. Social networking is booming, everyone is friending, following, tweeting, tagging, and grandma and grandpa are getting involved too. Wait a minute, did I just say grandma and grandpa? That’s what some recent Facebook research has shown. 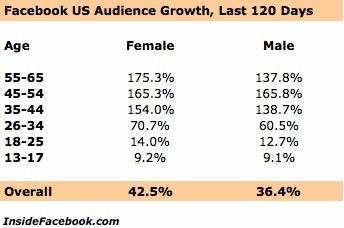 It seems the fastest growing demographic on the social networking giant is women 55 and older. That segment grew by 175% in February 2009, while men 55 and older grew by 137%. Her: I can’t seem to find some emails I’ve written. Me: Did you check your sent items? Her: I’m in my email already. Where are my sent items? Me: It’s the folder labeled “Sent Items” in Microsoft Outlook. Me: What are you using to check your email? Me: OK, so it’s web-based mail. Her: No, it’s on my computer. Me: Yes, but you are accessing your email on the web. I can help you. What’s your email address so I can send you some instructions? Her: I’m not sure, hold on. That conversation reminded me that not everyone is tech savvy. We come with computer chips built into our brains. Our kids instinctively know how to text and have built in wi-fi. But, we also grew up using computers on a regular basis. People that are 55 and older didn’t… We were typically the ones introducing computers and explaining how to use them. Needless to say, there’s a big difference between the various age groups and how they utilize new technology. After the phone call, I started thinking about people 55 and older and the data I saw about Facebook. I’ll be honest, I started having doubts that many people 55 and older are jamming on Facebook, tagging photos, using apps, providing status updates, and grabbing their vanity URL’s. So, why was I skeptical? My parents are in that age group, and all of their friends. My in-laws are in that age group, and all of their friends. In addition, all of my friends’ parents are in that age group, so on and so forth. So, I like to think I have a pretty good feel for that demographic, based on interactions I’ve had with them over the past few years. 1. Are you currently on Facebook? 2. If yes, what do you use it for? 3. How often do you visit Facebook per day, week, and month? 4. Do you enjoy Facebook? Why or why not? I ended up receiving 57 responses from people 55 and older. A quick disclaimer before I reveal the data. This is obviously not a scientific study, nor was it meant to be. I just wanted to receive feedback from a trusted group of people that were 55 and older to see if and how they use Facebook. Let’s see what they had to say. Wait, Facebook Can Be Helpful! Sprinkled in with the no’s were some great responses supporting Facebook. These enthusiastic responses made me think there is hope. The first one that struck me was from a friend’s mother-in-law. Her enthusiasm about Facebook jumped off the page. Literally, if she could friend me, tag my photo, challenge me to a trivia game, and become a fan of my Facebook page, I think she would. She explained how much she loves Facebook, how she keeps up with her children and grandchildren, and loves seeing everyone’s status updates, photos, video, etc. She logs in a few times per day. Yes, she was the exception, but she got it (big time). After reading her story, I received a few more no’s and then another great response came in. This time from a friend’s father, who logs in a few times per week to see what his kids are doing, he searches for people he went to college with, connected with some of them online and offline, etc. It was another great example of someone using Facebook in smart ways. He seemed to really like it. Clickset and Your Online Identity. Clickset is a new tool that helps you keep your online identity in one convenient place. Once you sign-up you can connect with your pre-existing accounts like Google and Yahoo. Previously hidden away behind closed doors, Cliqset, a social identity platform, is drawing back their curtains today and opening up their beta site to the public. Similar in purpose to the private beta site Chi.mp, Cliqset’s ultimate goal is to help users connect their online identities in one place so they can then safely share that online social identity with Cliqset-aware applications. Cliqset even claims to be the last social identity you will ever need. After signing up, new Cliqset members can connect their Cliqset identity with their pre-existing Google, Plaxo, and Yahoo accounts, which means those contacts can be pulled into Cliqset and grouped into relationships. Read more. I have now been an active Twitterer for over 2 years with over 850 followers that is growing daily. Twitter has been a very interesting social and business experience. I find myself using Twitter for everything from casual conversation, business contacts, researching links, posting jobs and fielding questions. As I explore micro-blogging, I have discovered a few likes and dislikes that I want to share with my readers. Here are some of my comments about “TweetFriends” and TweetFoes. Read more. Selling Skeptics on the Benefits of Social Media Marketing: A Personal Experience. More and more companies are turning to Social Media Strategies. In spite of all this attention there is still an element of weariness at the though of putting a profile on Facebook, MySpace or LinkedIn. After 4 years of eating and breathing Social Media I thought I would put a few notes together to help others take the plunge. The hooks: The why and where. Way back in 2004, my daughter, still in high school, soon to be a graduate and off to college, announced that now she could finally get herself a Facebook profile. At the time it was open only to college students. Needless to mention I was intrigued. I already had a MySpace profile for the company and could not see it being of much use. Once Facebook opened its doors to the general audience I was the first to get an account. To my surprise I found that I was networking with my peers and I discovered that not only I could post information but I got lots of good resources in exchange. I joined every group, downloaded every app and made tons of friends. I was now officially part of a community that could benefit my business. I was now hooked! The more I shared our information, the more traffic came to our website. For very little cost I was able to create massive brand awareness. I saw a steady increase from month to month and a steady increase in lead generation. I devised a system that enabled me to do my actual work and make some time for networking. 20 minutes 3 times a day. For example: the phone call to a client became a personal wall post on Facebook and I began fielding inquiries through LinkedIn. Facebook has a “fan page” feature and a “groups page” here you can promote your products and services to your network of friends and colleagues. You can also create vertical groups for your “niche” pages. LinkedIn is the choice for the corporate set and is strictly networking. One of the features is an answers box, here you can share expertise in your field. MerchantCircle allows you to market your business in the neighborhood, it is a “business in a box” concept with all the tools you need to promote your services online. Twitter is a micro-blog that allows you to post 140 characters. Here you can share relevant links, talk to your fans and follow relevant posts. The more followers you get the more visible you become. YouTube speaks for itself. Needless to mention it exemplifies the power of viral marketing. For those still wondering, I recommend that you work closely with your online marketing agency to establish a social media time allotment, which profiles make sense and what the ROI could be. And of course watch the metrics. If you are seeking the most effective way to build your brand identity on Twitter to increase traffic to your site, then The Web Success Team recommends this great article. By The results of your social media networking depends on what you want to achieve with the time you invest on social media. If you have specific objectives, chalk out a plan before you get started.